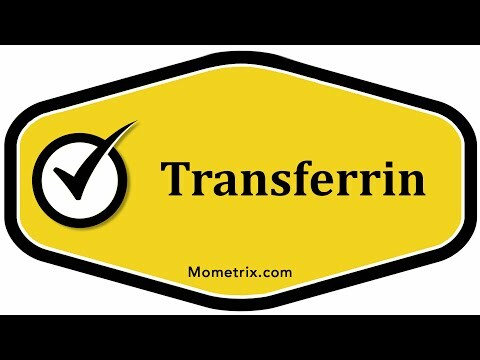 Today in this video we want to go over Transferrin. Transferrin is extremely important in our health as it binds iron to our system and transports it to the place in our body that needs iron to produce red blood cells. If Transferrin is not doing its job or is not present in the amount it needs to be or its doing its job too well you can have one of two problems. Too little iron in the system leads to anemia. Too much iron in the system leads to problems on the other side with high iron concentration and blood poisoning and things like this. So Transferrin is extremely important. It is a blood plasma glycoprotein and its job, of course, is to find and bind free iron and it binds very tightly yet that bond is reversible and as it binds the iron as a protein, transports it to the liver or to the bone marrow and when it comes into contact with certain receptors then the surfaces of cells in that area it then releases its iron. Transferrin is primarily produced in the liver. It is also produced by the brain but its primary place of production is the liver. It binds iron and transports it to the liver, bone marrow and other places like that. When it encounters one of these inceptors on the surface of the cell, the iron is released to transport it to the inside of the cell by a vesticle also known as endocytocis. Transferrin saturation can be measured and determined. The total iron concentration divided by total iron binding capacity. Now when we talk about iron and iron binding and releasing it, this really does have profound effects on people with renal disease. Those suffering from kidney problems need to have a 20 and 50 percent saturation level according to the kidney disease outcomes quality and initiative guidelines. So when – you’ve got end stage renal disease you need to try to keep this right here – Transferrin saturation between 20 and 50 percent. So Transferrin is very important to our health as it binds iron, takes it to the place where red blood cells can be made. Remember it is a blood plasma glycoprotein. It binds iron, takes it to the places like the liver and bone marrow where they find these cells that have receptors on the surface where it then grabs the iron from the Transferrin and transports it into the cell and then processes appropriately.